We haven't yet reached the stage where physical paper is a thing of the past, but Sony is hoping to take us one step further to achieving that goal with a brand new device. 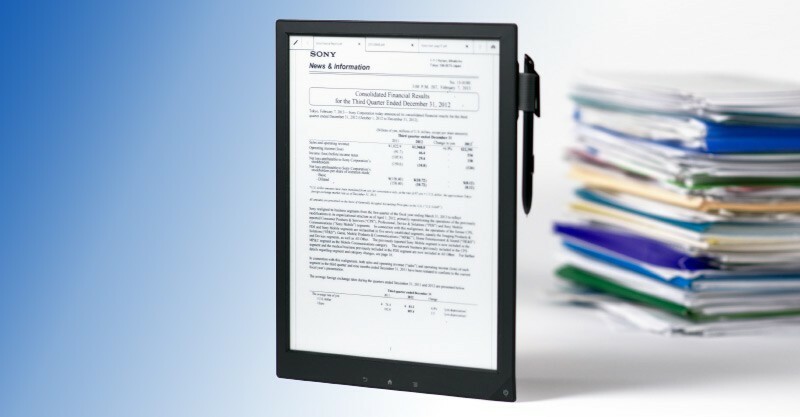 Called the 'Digital Paper', the 13.3-inch E Ink tablet-like device is designed for business, educational and legal uses, potentially replacing stacks and stacks of paper. The massive device is actually quite light, coming in at just 355 grams, but with the same three-week battery life you'd expect from an e-book reader. And an e-book reader is essentially what the Digital Paper is, although it does support touch and stylus input for manipulating pages and annotating. Sony isn't particularly clear about the hardware inside the Digital Paper, but it appears to have a 1200 x 1600 16-level gray scale display (without a backlight), Wi-Fi 802.11b/g/n support, a microSD card slot to complement 4 GB of internal storage, and support for just PDF files. How much will the Digital Paper set you back? A whopping $1,100, which is definitely a result of its professional-oriented feature package. Sony will be introducing the device at the American Bar Association Tech Show, which has been running over the past few days.